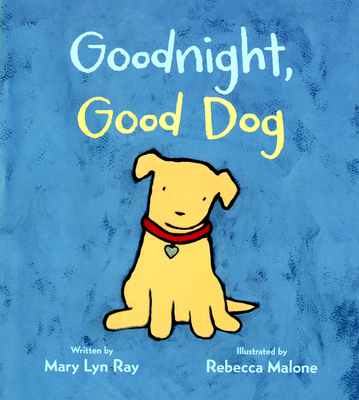 Say goodnight to a good dog, in this padded board book with a touchable, flocked dog on the cover. For one restless pup the waking world is too full of wonder to leave behind at bedtime, until he closes his eyes and finds comfort in his dreams. In the tradition of Goodnight Moon, Mary Lyn Ray's warm and accessible storytelling celebrates the sights and sounds of the night to reassure young children at bedtime. For one restless pup the waking world is too full of wonder to leave behind at bedtime, until he closes his eyes and finds comfort in his dreams. Mary Lyn Ray's warm and accessible padded board book, now with a touch-and-feel dog on the cover, celebrates the sights and sounds of the night to reassure young children at bedtime. Rebecca Malone's art is created with acrylic paint on watercolor paper, though she occasionally illustrates with pen and ink or a computer. She lives in Brimfield, MA. Visit www.rebeccamaloneillustration.com. "Whether or not audiences catch the kidproxy echoes in the dog’s resistance to bedtime, they’ll be enchanted by the pooch’s dozy meanderings and eventual sleepy example." "Ray’s pleasing text recreates the dog’s experiences without a wasted word. The illustrations expand the narrative and express its tone visually...A satisfying picture book that’s just right for bedtime reading." "This snuggly bedtime story shows the dog’s girl going happily and quickly to sleep while he pads restlessly about the house, creating a potentially empowering contrast for human bedtime resisters." * "The pace of the page turns gently slows down as this good dog heads to his dreams. Goodnight, Good Dog. Sure to be shelved next to Goodnight, Moon. It deserves that rarefied spot." * "Ray...again proves herself a gifted writer, capable of highly distilled poetic prose that's beautifully accessible and allusive. Malone's bright acrylics, simple shapes, and minimalist detailing...are a terriffic match; her canine hero is endearingly eager." "This effective bedtime story reminds kids that fun will be had again when they wake—but first comes sleep."